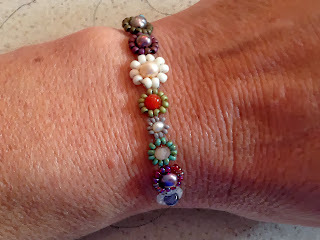 Lisa Yang's Jewelry Blog: Daisy Chains: I'll Never Outgrow Them! Daisy Chains: I'll Never Outgrow Them! I'm working my way through the stitches in Beth Stone's Seed Bead Stitching book, and I've jumped ahead to daisy chain. Yes - that simple daisy stitch we all learned when we were kids is what I'm playing with now and I'm loving it!! I love flower motifs anyway, but until I started the projects in the Seed Bead Stitching book, I don't think I gave enough credit to the simple daisy chain. The projects in the book show so many ways to use it!! In all fairness though, the inspiration for this project comes from Beth Stone's second book on bead stitching called More Seed Bead Stitching: Creative Variations on Traditional Techniques. There's a bead soup daisy chain on the cover that I fell in love with - right in the middle. The stitch technique I used for mine is in the first book though. Using bead soup is not the easiest way to do this stitch, but I'm very happy with the results. If you're interested in trying daisy chains again, but don't want to get the book, here's a Free Tutorial from Sandra Halpenny's blog. This is very similar to the stitch that I've used for my bracelet, but mine varies the number of petals based on the size of the center bead - thus making you have to think each time you start a new flower. Ah well - live and learn.